Salt soap is soap made with high content of salt, usually range from 50~100% of soaping oil. It can be done in cold process and also oven process. The first time I tried making salt soap I did it in oven process, meaning using oven heat to force it to saponify in 90 minutes then cut right the way when it's cool enough. If it's left uncut for hours you won't be able to cut it anymore, it would turn rock hard, that's the salt working. Since then I've been soaping salt bars cold process. I make my salt soap the same way I make all my other soap, cold process, because I use milk to soap. Without using the oven heat to force saponification I need to avoid cutting because that high of salt content would harden the soap and make it too crumbly to cut. 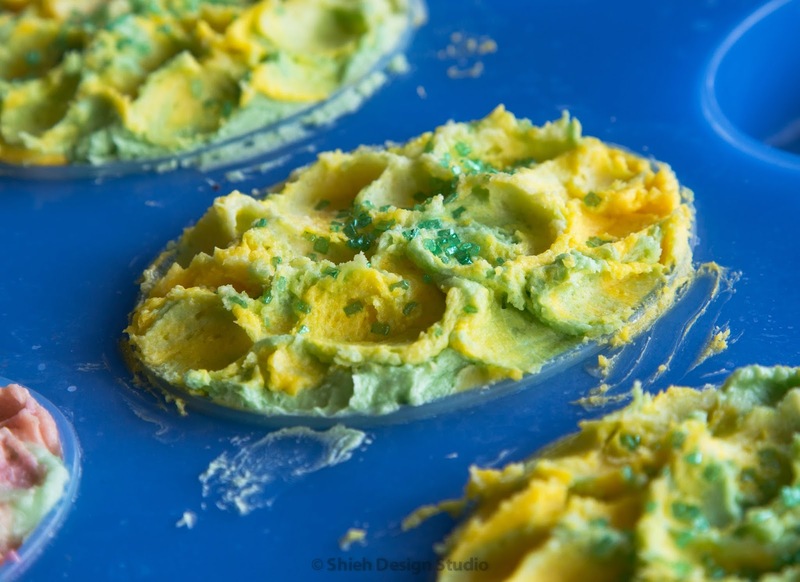 My solution is using individual silicone molds. My favorite shape is oval, easy fit in my palm and easy to tumble under water. Besides being rock hard, another obvious characteristic of salt soap is it doesn't produce bubbly suds. It makes rather creamy lather almost lotion like. 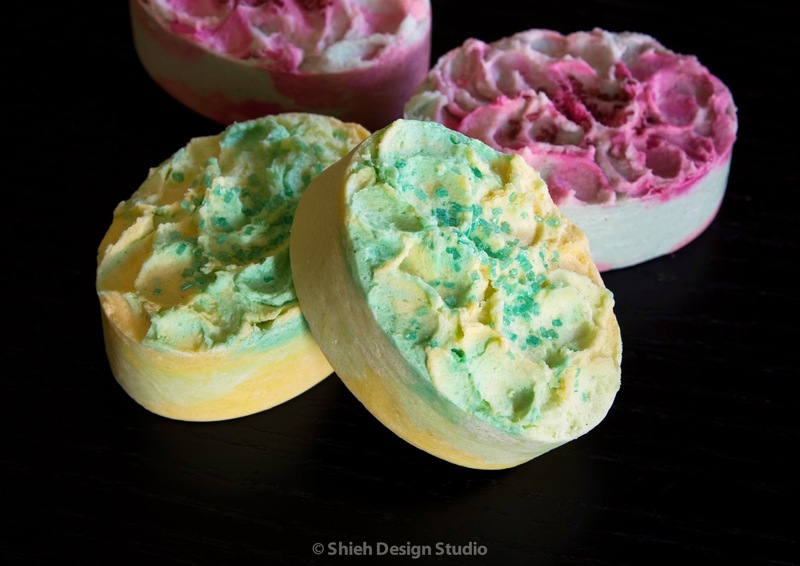 What's salt soap good for if it doesn't lather well? High concentration salt is very effective in exfoliating dead cells off your skin leaving you clean but smooth after shower. Think about the reason why people take bath with salt soak, it softens your skin and exfoliates away dead skin cells. If you don't have time to take a long luxury bath or simply don't have a tub at home, using salt soap in the shower would be the only alternative. I have tried a few different salt to soaping oil ratio in the past, and finally settled with 80%, meaning if I use 100 g oil to soap, I would add 80 g of salt. 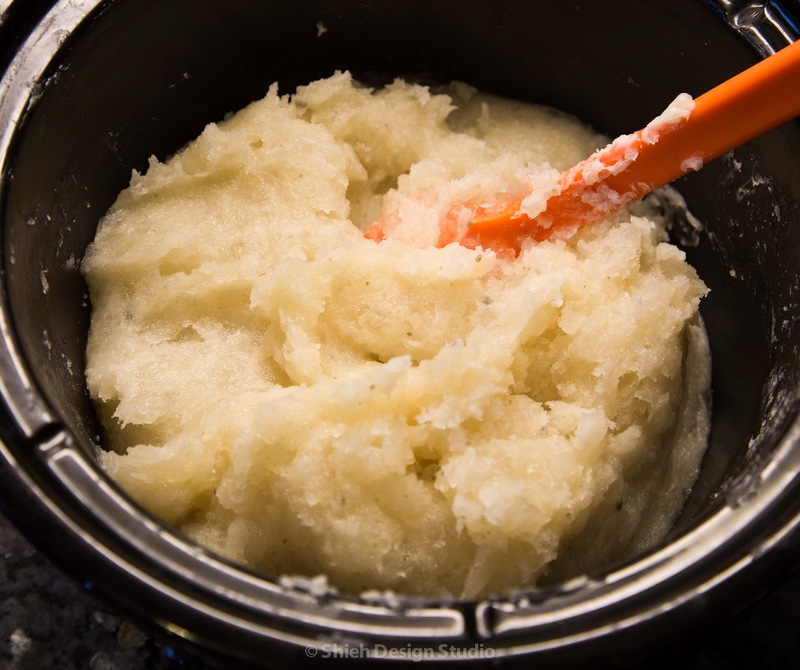 Almost any kind of salt can be used to make salt soap, even table salt. The only salt that's not good for salt soap is Dead Sea Salt. Dead Sea Salt has a property of attracting moisture in the air, if used in big quantity it would cause the soap to sweat and weep if it's at a humid area. I like using sea salt and Himalayan pink salt for their richness in mineral. I love using salt soap to wash my combination skin type face. It is not suitable for sensitive skin or wounds, think about how much it hurts when your wound touches salt... ouch. 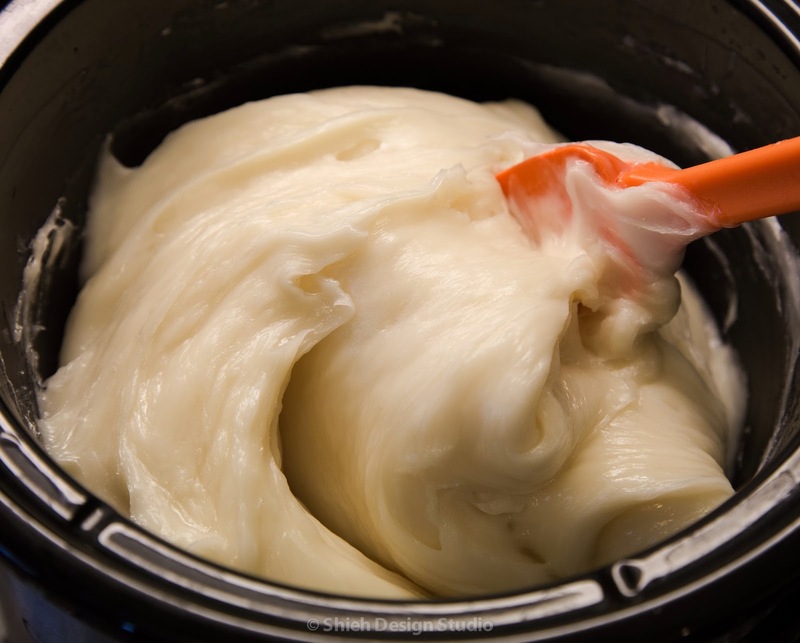 What is cream soap? It is not solid bar soap most of us use daily, not liquid soap either, rather in between, more like shaving cream but it is soap! How is cream soap made? We use sodium hydroxide to make bar soap, potassium hydroxide to make liquid soap. 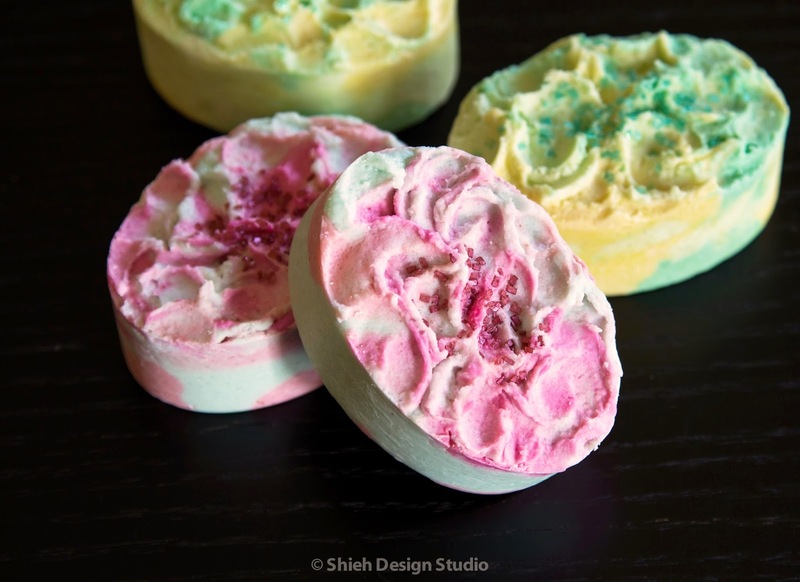 Cream soap is a hybrid of the two, made using both sodium hydroxide and potassium hydroxide, together, to make soap staying at cream consistency. 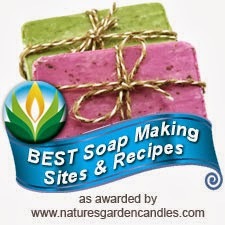 Making cream soap is more complicated than making bar soap and liquid soap. I have to admit, after researching on and off for a year, I'm still pretty confused and cannot in the life of me figure out how to formulate by myself. But with help from one of my soapy friends, I took the plunge and made my first batch, a small one, just too experiment. It took quit a while to get traced then it got sticky, like thick caramel, the kind that always get stuck in your teeth when you eat the chocolate. So glad I took the stick blender out earlier or it would get stuck in the mixture, that's how sticky it got. After the sticky caramel stage it took very little time to turn into dry mashed potato. Then I put it to cook for 2 hours and mixed every 30 minutes while cooking. Gosh it got so hard to mix my hand hurt so badly after cook. After adding the super cream I let it sit in the pot over night to rest. The next day it relaxed a bit. I broke the mess into little portions and attempted my first whipping. Oh boy, I almost burned my hand held mixer, it's too sticky and hard! I then mixed in aloe juice little by little and it finally got loosen up, it turned white and had this pearlescent appearance on top. The one thing I don't like about cream soap, the one thing that made me so hesitated to try in the first place, is the fact that it needs to "rot" for a long time, 6 month in average! What's rotting? It's not going bad or growing nasties or fermenting. 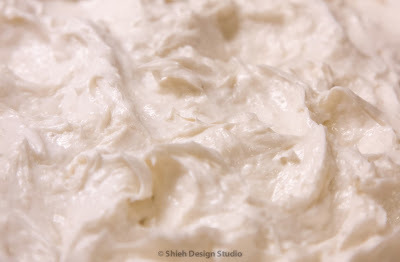 It is a process to break down and transform to final fluffy cream soap it's meant to be. Don't ask me why people call this stage "rotting" stage, we the soapers have weird terminology I guess, LOL. It has been only 4 weeks since but I already peeked more times I can count! I need someone to hid it where I can't find it or the curiosity is going to kill this cat here! If you are interested about the result, look out for another post few month from now.